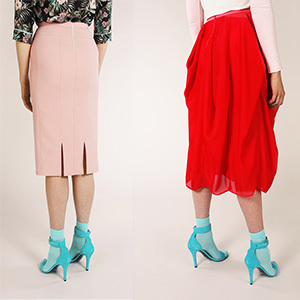 The Zaria Skirt pattern includes two variations: A pencil skirt and a flowy chiffon skirt. Both styles are high-waisted and lined, with an invisible zipper at the back. The pencil skirt has flattering topstitched seams and two slits at the back and the flow skirt has a pencil skirt underneath, and a pleated chiffon skirt on top. Only one slit at the center back. 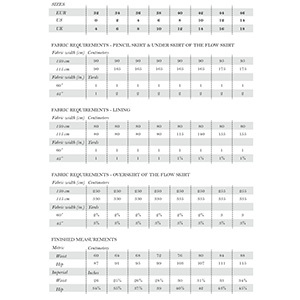 Suggested fabrics for the pencil skirt and underskirt are slightly stretchy fabrics such as stretch denim or cotton sateen. 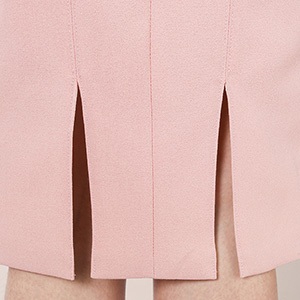 Use a stretch lining such as milliskin and a very light and drapey chiffon for the pleated layer of the flow skirt.